A controversial ordinance requiring panic buttons for hotel employees moved closer to law on Tuesday with the City Council voting 5-0 in favor, while four members walked out for the second time in protest. The panic button ordinance to protect hotel housekeepers from sexual assault has been a source of contention for the nine-member council, with some members believing that its timing is a political ploy to confuse voters and prevent the passing of a similar effort called Measure WW, which appears on the Nov. 6 ballot. Measure WW would require panic buttons in hotels with 50 rooms or more and also includes labor and workload provisions, such as limits on how much square footage a housekeeper can clean in one day. The measure has exemptions for unionized hotels. The separate city ordinance requires panic buttons for all hotels and motels in the city but does not include the labor provisions and union exemptions. Third District Councilwoman Suzie Price proposed the ordinance in September after she said she felt the labor provisions in Measure WW were politically motivated. But the council members in favor of Measure WW—Rex Richardson, Jeannine Pearce, Lena Gonzalez and Roberto Uranga—believe the ordinance has its own political agenda. In a rare move, they walked out of a council meeting in protest last month. The four did the same on Tuesday, choosing to walk out rather than vote. Richardson said he’s received mailers stating that the city has passed a panic button ordinance ahead of the November election. “The timing of this is all political,” Richardson said. Pearce and Gonzalez said they were concerned that little outreach had been done on the economic impact to small hotels. Pearce noted that the ordinance doesn’t include workers who are subcontractors and has no protections against employer retaliation. “This isn’t doing our housekeepers any good,” she said. The tension escalated when Richardson asked to again go through each of the revisions to the ordinance, prompting Price to snap back. Councilman Al Austin said he supported the ordinance because he’s focused on safety for housekeepers. The ordinance will come back for a second reading and final approval by the city council in December. Hotels and motels would then have six months to provide the panic buttons. A recent city study found that at least 11 hotels, comprising more than 3,200 rooms (52 percent of all hotel rooms in the city) already have panic buttons for housekeepers. The Westin Long Beach has supplied panic buttons for its housekeepers for about two years, said Marco Castillo, director of housekeeping. Castillo said the devices attach to keychains and can sounds off a piercing alarm. They cost around $10 each. 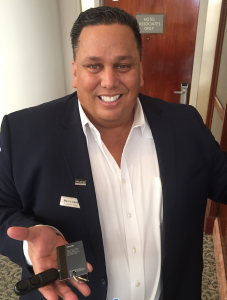 Westin director of housekeeping Marco Castillo shows a panic button for staff.